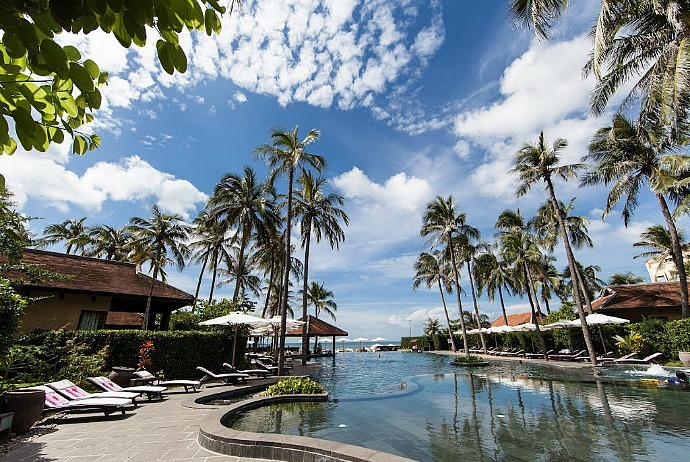 When it comes to Vietnam (Việt Nam) tourism, the luxury beach resorts seem to be the preferred choice of many domestic and international travelers. 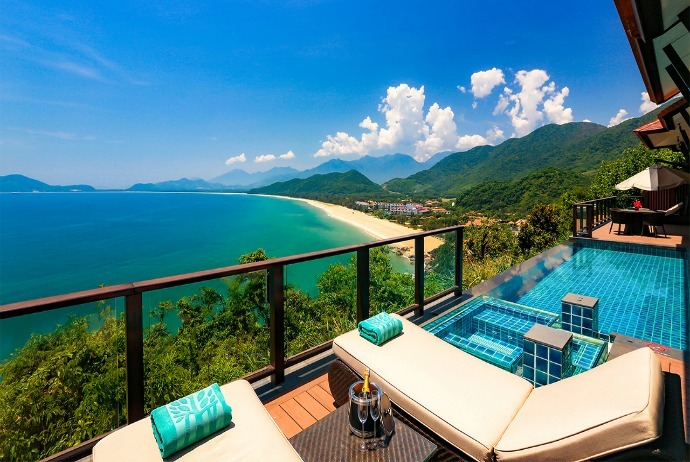 This article will gather 7 out of best beach resorts in Vietnam which have beautiful views. This is a new beach resort located in Ninh Thuan province, which has a great terrain on top of the cliff that overlooks dreaming Vinh Hy Bay (Vịnh Vĩnh Hy). Here, each pavilion is designed and arranged in harmony with the nature, overlooking the mountains, sea and lakes. The private and pure space in the lotus pond is where yoga classes take places. Here, people could indulge themselves in the quietness as well as calmness on the peaceful surface of the water. Inside this resort, there is a swimming pool, in addition to gyms, tennis courts and a walkway leading to the national park – all of them give travelers a feeling of relaxation as in the paradise. 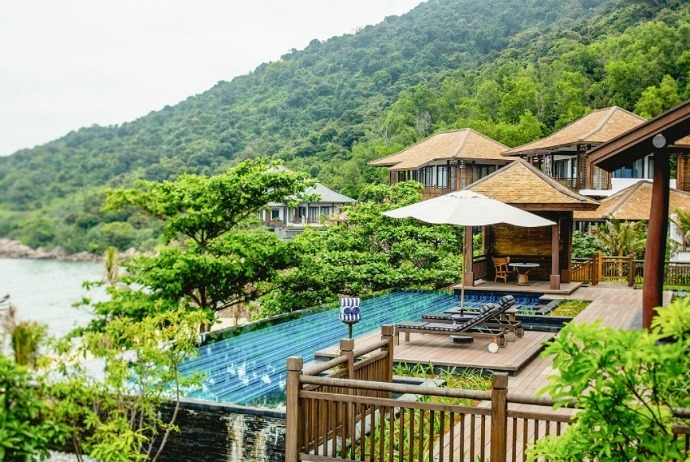 Situated in the pristine heaven of Con Dao, Six Senses Resort is a 5-star resort reaching the international levels. Having 500 unique and elaborate villages, this resort is worth being one of the best beach resorts in Vietnam. Each villa here has its own butler and swimming pool. Also, there is a private spa area where tourists could relax with some fitness facilities. Tourists could spend an afternoon for leisure in the library or simply dive in the clear blue water. 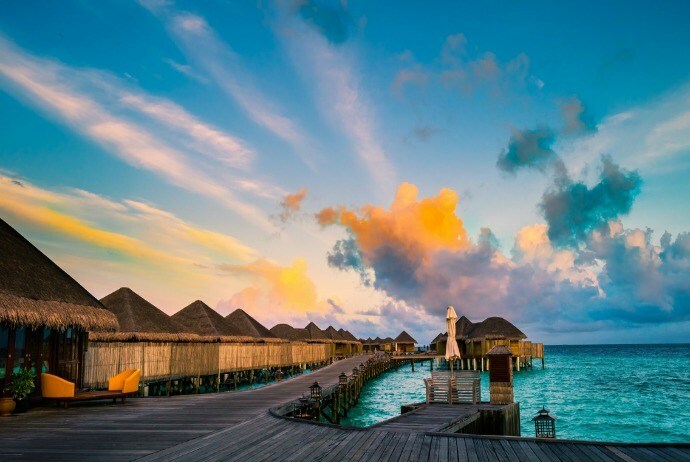 To be honest, the resort has a perfect combination of ecological environment and exquisite architecture, making tourists feel the whole value of the nature. Situated in Son Tra peninsula, Danang, Intercontinental Sun Peninsula is ideally surrounded by wonderful sceneries of a tropical forest and overlooks an extensive beautiful sea. 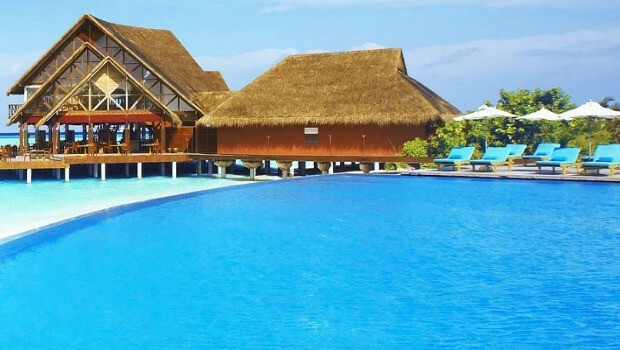 The beach resort itself has 197 rooms, suites as well as villages that overlook the sea. Covering an area of 70 m2, the rooms in this resort are reckoned the largest ones in the region of Southeast Asia. Its cultural architecture blended with modern facilities provides essential comforts for travelers in such a traditional environment. This beach resort is situated on a beautiful beach of Ha My (Hà My), belonged to Quang Nam (Quảng Nam) province. The Nam Hai Resort spreads an area of 1km and has pristine coastline which was voted as one of the most beautiful beaches in the planet. This resort brings to travelers a feeling like a village with the beachfront villas. It is rather fresh and quiet with 100 private villages specially designed with black wood. There are swimming pool areas which are combined as the inspiring float plane. Inside the resort, there are 8 spa treatment rooms that are floating between the Lotus Lake, leaving separate relaxing environment and spaces for guests. 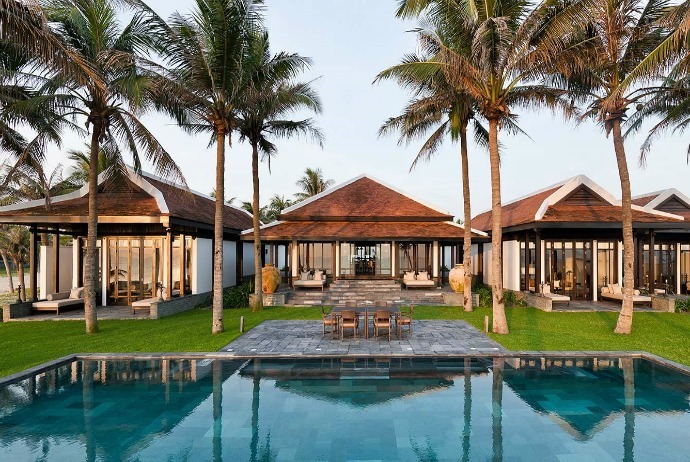 Considered on the first standard 5-star resorts in Vietnam, Anantara Mui Ne Resort is situated amid the green tropical gardens and sees through the Gulf of Phan Thiet. Located in Mui Ne beach and supplying extensive spa facilities, the resort offers high quality rooms for tourists. Not mention to the amenities in each of the room, there are also modern gyms that overlook a tranquil garden. In this resort, tourists can also experience other interesting things in Mui Ne’s fishing villages. This resort is situated on Hon Heo (Hòn Hèo) Island, Ninh Hoa (Ninh Hoà) District, Khanh Hoa (Khánh Hòa) province. It just takes about 20 km to travel from Nha Trang city to this resort. Having 33 wooden villages, the resort system has standard 5-star services. 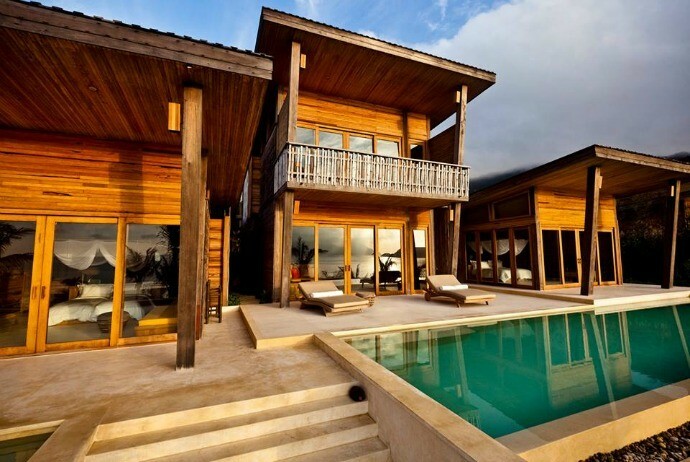 Here, every villa has both outdoor and indoor space. Guests will inspiringly feel novel within the vast surroundings of nature. Among best beach resorts in Vietnam, this 5-star resort is the most advanced one close to Lang Co beach. It is an ideal choice for tourists to choose to stay when traveling in Hue. 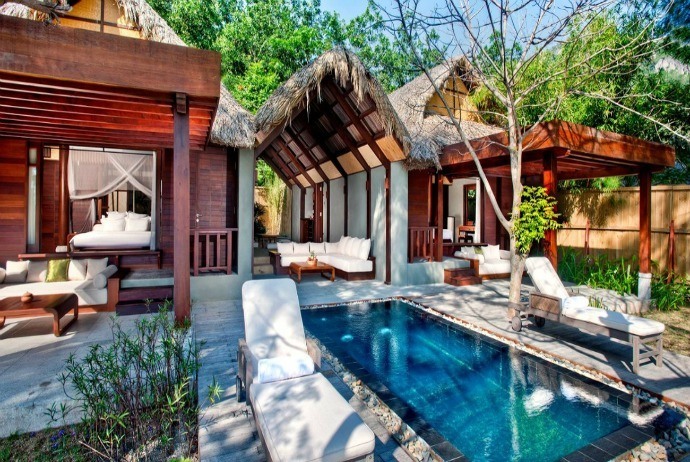 Having 49 rooms in total, containing beach villas and swimming pool villas, and equipped with modern facilities and furniture, Banyan Tree Lang Co supplies recreational facilities like golf courses, outdoor pools, water sports, massages, squash courts and spas.